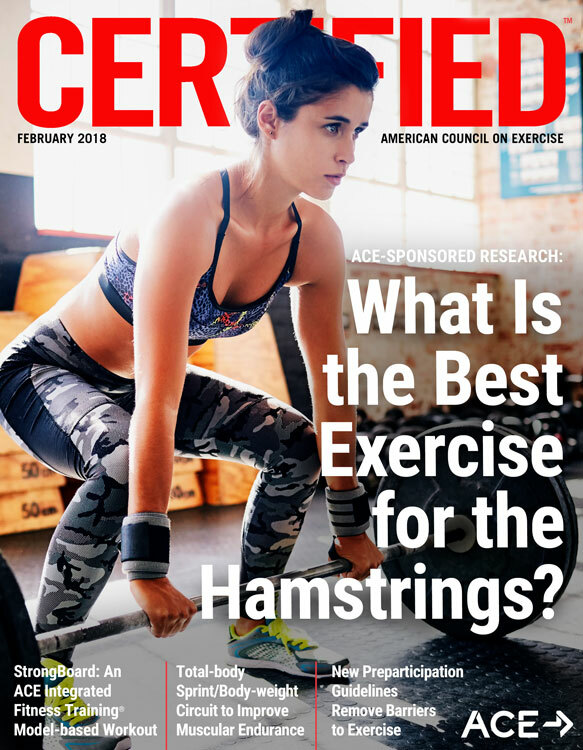 ACE-SPONSORED RESEARCH: What Is the Best Exercise for the Hamstrings? Study: Healthy Diet = Happy Child? Preparticipation health screening has long been a sticking point for personal trainers. Not only was the actual process complex, but knowing what to do with the information gathered could be confounding. 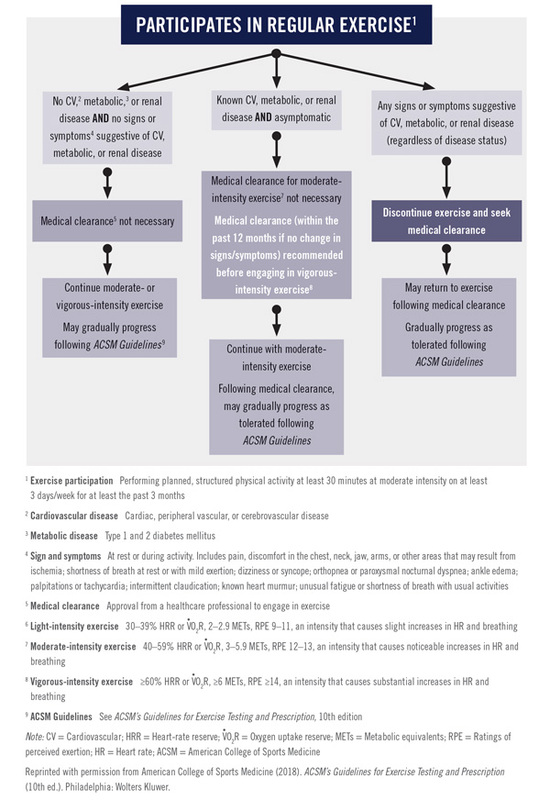 In the most recent edition of ACSM’s Guidelines for Exercise Testing and Prescription, the American College of Sports Medicine (ACSM, 2018) revamped its preparticipation health-screening recommendations. The result is a much more streamlined process that removes any unnecessary barriers to becoming more physically active, allows more clients to exercise without having to first visit their doctor and takes some of the decision-making burden away from the personal trainer. The previous prescreening algorithms could result in excessive referrals to physicians for medical clearance, creating a potential barrier to adopting an exercise program. In addition, these referrals created a financial burden for both clients and the healthcare system. The truth is, exercise is safe for most people and has many health and fitness benefits. When it comes to the cardiovascular risks associated with exercise, those risks decrease as individuals become more physically active and fit. In addition, exercise-related cardiovascular events are rare and are often preceded by warning signs and symptoms. Stated simply, the last thing we want to do is unnecessarily discourage anyone from exercising. 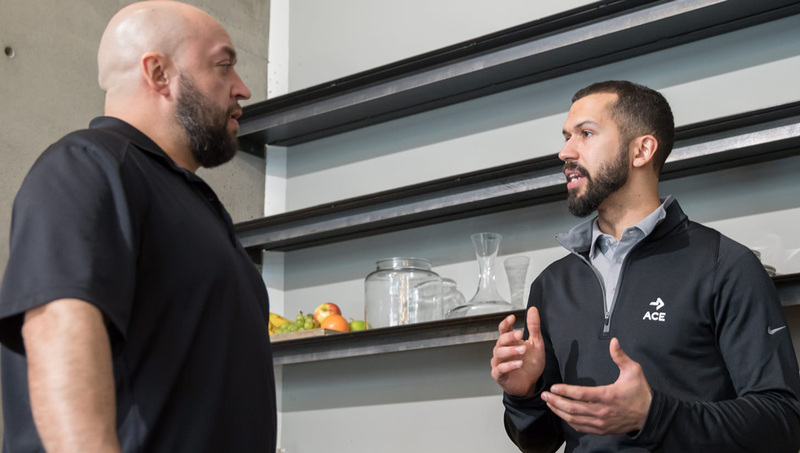 The new process allows trainers to work immediately with more potential clients, creating the opportunity for a more rapid development of rapport and minimizing the risk of an individual leaving the fitness facility discouraged, never to return. The removal of this barrier eliminates several steps that came before the client was even able to work out for the first time. Less back-and-forth with doctors means that clients can get started with their programs more easily and still feel safe doing so. The new screening protocol also makes general recommendations for medical clearance, leaving the specifics—such as the need for medical exams or exercise tests—up to the discretion of the healthcare provider. For those who do not exercise regularly: If a client has cardiovascular, metabolic or renal disease, or signs or symptoms that suggest he or she does, then medical clearance is necessary. 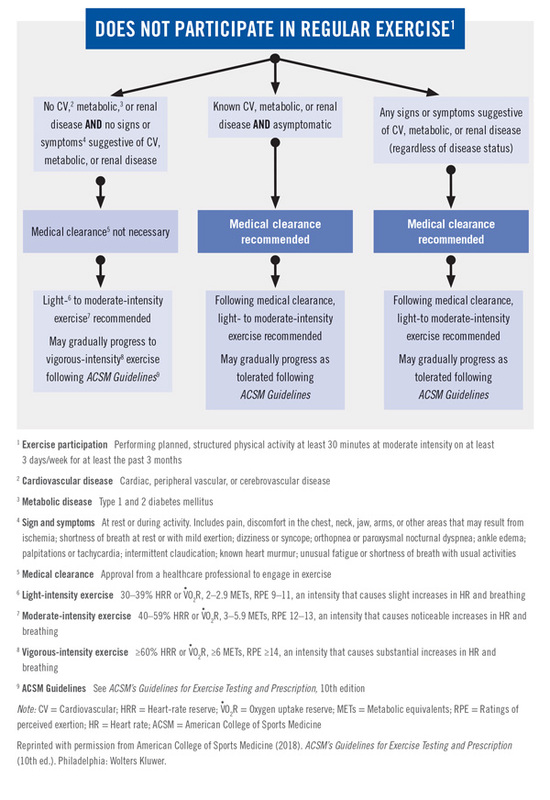 For regular exercisers: If a client has signs or symptoms suggestive of cardiovascular, metabolic or renal disease, he or she should discontinue exercise and seek medical clearance. If a client has a known history of cardiovascular, metabolic or renal disease and has a desire to progress to vigorous-intensity aerobic exercise, medical clearance is recommended. Current evidence is insufficient regarding cardiovascular complications during resistance training to warrant formal prescreening recommendations (ACSM, 2018). Little data are available on the topic, but it appears that the risk of complications is low. Preparticipation health screening for individuals wanting to initiate an exercise program should be conducted using the 2017 Physical Activity Readiness Questionnaire for Everyone (PAR-Q+) form. This form is evidence-based and was developed with a goal of reducing unnecessary barriers to exercise. The PAR-Q+ can be used as either a self-guided screening tool or as an additional element of screening for health and fitness professionals seeking additional client information. 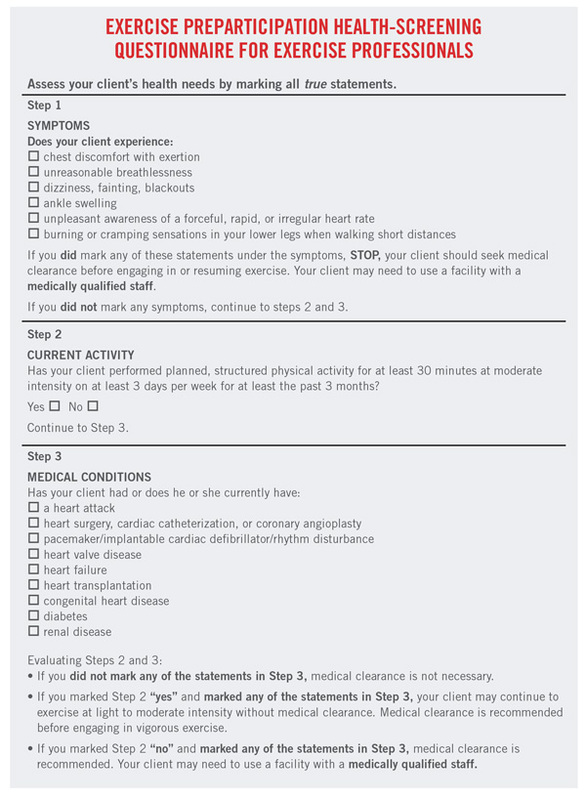 Health and fitness professionals working with clients with known cardiovascular disease in clinical settings, such as cardiac rehabilitation and medical fitness facilities, should use a more in-depth screening tool than the one just presented (ACSM, 2018). Specifically, it is recommended they use risk-stratification criteria from the American Association of Cardiovascular and Pulmonary Rehabilitation (AACVPR). A main feature of the previous screening protocol was the identification of each client’s cardiovascular disease risk-factor threshold, which was then used as the basis for the classification of his or her risk and the plan going forward. For example, a woman who had a sedentary lifestyle, stage 1 hypertension and a body mass index (BMI) of 32 kg/m2 would have a total score of 3, placing her in either the moderate- or high-risk category, depending on the presence of symptoms of disease. Gagliardi says that, while risk classification is no longer part of the screening process, this is still important information to gather in the early stages of any client–trainer relationship. “Understanding a client’s medical history is essential, as it allows for the individualization of both the programming and education for that client moving forward,” he says. In addition, Gagliardi points out that this data can serve as a baseline for any exercise programming or lifestyle change. Imagine being able to show the aforementioned client that by establishing and then maintaining an exercise routine that reduced her blood pressure and lowered her BMI to below the obesity threshold, she would have eliminated three risk factors for cardiovascular disease. When using the previous health-risk screening protocol, personal trainers were often left frustrated because of the number of referrals required. In fact, the vast majority of clients had to go to the doctor before they could begin working with the trainer, and many of them would never make it back to the gym. The new screening process is much more user-friendly and allows personal trainers to work with more individuals more quickly. American College of Sports Medicine (2018). ACSM’s Guidelines for Exercise Testing and Prescription (10th ed.). Philadelphia: Wolters Kluwer. Daniel J. 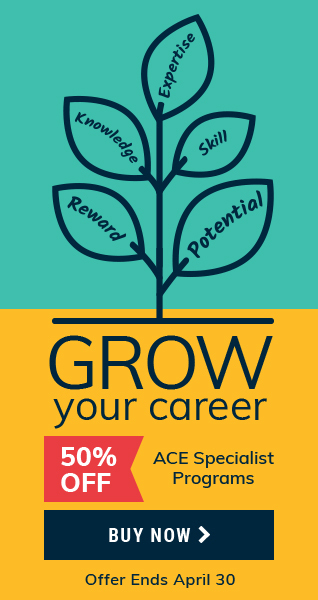 Green is ACE’s Senior Project Manager and Editor for Publications and Content Development. In addition to his work with organizations including the International Association of Fire Fighters and Agriculture Future of America, Daniel writes an ongoing blog series covering lifestyle change for NBCbetter.com. He has also written feature articles for local publications in Western North Carolina (WNC), including WNC Parent and WNC Magazine. When it comes to the cardiovascular risks associated with exercise, those risks decrease as individuals _________________________. Under the new guidelines, if a client with known disease is symptom-free and a regular exerciser, he or she _______________________. Preparticipation health screening for individuals wanting to start an exercise program should be conducted using the __________________________.